We view early childhood years as the most formative years in laying strong foundations for literacy, intelligence, character development and essential skills. Speech and language are central to our kindergarten curriculum. Modules (each consisting of 12 classes) are topic-based and designed to develop students' skills in communication (speech, phonics and guided writing), creativity and collaboration. A main focus of the kindergarten curriculum is phonics - the first literacy milestone towards successful reading and writing. 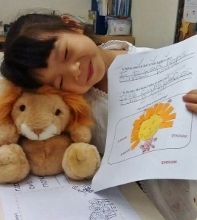 Starting from K1 level, we have infused Jolly Phonics in every class to progressively and systematically build up young children's recognition and application of letter sounds. Students are taken through stages of blending and segmenting words to develop a solid foundation for reading and writing. As students approach K2, practical learning activities are incorporated to enhance cognitive and confidence development, better preparing them for primary school curricula and interviews.